A leaked internal audit has revealed the World Bank's stark negligence in its involvement with a notoriously controversial new gold mine in Guatemala. The confidential draft report by the Compliance Advisor Ombudsman (cao), an internal watchdog at the International Finance Corporation (ifc) -- the World Bank's private sector lending division -- condemns the institution for not sufficiently assessing environmental and humanitarian impacts before approving a us $45 million loan in June 2004. The Canadian company Glamis Gold Limited, through their subsidiary Montana Exploradora de Guatemala, is already forging ahead with the us$254 million ten-year project. The open-pit cyanide leach gold mine is currently under construction in Guatemala's dry western highlands, near the village of San Miguel and the home of the indigenous Mam and Sipacapa people. Water is scarce for the area's subsistence farmers. 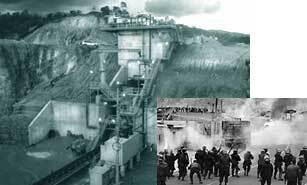 The mine will use over 25,000 litres of water per hour, spraying ore with cyanide to leach out the gold. Scientists have warned acid and cyanide contamination is likely to be a high-risk and long-term problem. Local organisations in Guatemala as well as international ngo s have voiced concerns about and growing tensions with local people. A forty-day protest in January 2005, led by thousands of local villagers against the mine's probable environmental impacts, ended in a violent clash with security forces, with one dead and many injured. On March 13, an off-duty employee of Glamis' security company shot a villager dead. A report by the Guatemalan Human Rights Ombudsman in May said the license for the mine should be withdrawn because of the Guatemalan government's violation of International Labour Organisation Convention 169 on Indigenous and Tribal Peoples, which gives indigenous populations the right to prior consultation about the use of natural resources on their lands. A June local referendum on the Marlin project, involving over 2,000 participants, yielded a vote of 98 per cent against the mine. The board of directors at the ifc itself admitted doubts about the project, noting ifc was relying mostly on information from Glamis itself, rather than an independent unit, and that the mine would provide only 160 long-term jobs. Glamis Gold firmly refutes these claims. Kevin McArthur, president and chief executive of Glamis, said, "We are convinced this will be good for the local community." CAO investigates Following a formal complaint from Madre Selva, a Guatemalan environmental organisation, the cao carried out an investigation in May, reviewing the project's supposed compliance with the ifc's social and environmental policies. The report, not publicly released at the time of writing, found major flaws in ifc's assessment of the mine. The cao blames the growing tensions on ifc's failure to adopt a policy regarding human rights: "the ifc should have considered more systematically the potential risk on human rights at the project level; it should have taken appropriate measures to mitigate these risks". The cao also pinpoints ifc's failure to allow enough time -- given the complexity of the social and environmental impacts of open-pit mining -- to allow "a reasonably informed consultation" to take place. According to the cao, the ifc lacks clear criteria and procedures for evaluating such impacts. Recommendations from external and third-party auditors, as well as ifc requirements, can be waived without justification; processes to ensure these are implemented are unclear. Now review it The report ultimately calls on ifc to adhere to the key recommendations of the World Bank's recent Extractive Industries Review, in providing better evaluation, transparency, community involvement and investigation of future projects before investment. The leaked report is a painful blow to oil and mining sector lending policies, newly reformed under the Extractive Industries Review. The three-year review, which found serious failings in the Bank's social and environmental management of projects in these sectors, proposed wide-ranging reforms, including ensuring that local communities support and benefit from the funded projects. With the Glamis mine as the first major mining initiative approved by the Bank since the review, the ifc's failure to comply with the limited commitments made is unwelcome -- but not surprising -- news.